Dogs and people are very similar when it comes to their immune systems. Although neither can get sick from the cold directly, cold weather can and will lower an individual's immune system, making them more vulnerable to infections and viruses. Maintaining a daily regimen of nutritional supplementation will ensure your dog has all of the vitamins and minerals he/she needs to make it through the winter without getting sick. Keep your dog moving: It's easy to be more sedentary in the winter months but that can be detrimental to sore joints. Continue to walk your arthritic dog daily to keep the joints from becoming stiff and more painful. Be sure to walk on surfaces that aren't slippery. Dog booties can also help your dog keep good traction. Watch your dog's weight: If your dog is moving less during the winter, it may be necessary to decrease his calories a bit. Becoming overweight puts extra strain on already-sore joints—and this aggravates arthritis. Consider Medications or Supplements: Supplements like HardyPet Joint help keep your arthritic dog comfortable. Glucosamine: A two-amino derivative of glucose which is obtained through the hydrolysis of chitin, a polysaccharide found in the shell of crustaceans. HardyPet formulas contain natural glucosamine found in Refined Oyster Shell.Chondroitin: A naturally occurring product found in animal cartilage. HardyPet formulas contain natural chondroitin found in premium Shark Cartilage. Dogs can get frostbite and it usually occurs on the toes, ears, and tail. If it is cold enough outside to be concerned about frostbite for yourself, be concerned about your dog as well. Limit your dog's time outdoors during frigid temperatures. A pair of doggie booties and a sweater can help but don't rely on them alone. If your dog has been outside during extremely cold temperatures, examine his skin for any areas that look pale. If you find any, contact your veterinarian immediately for help. The stress that colder weather puts on a dog's body systems is well known. One of the more closely studied is the digestive system. The natural enemies of a healthy digestive tract is the pH level and yeast overgrowth. Both of these problems worsen with exposure to colder weather. This translates to increased ear infections due to yeast, stool irregularities, decreased nutrient absorption, and other body systems being affected by poor nutrient intake. Products like HardyPet PRO6 canine probiotic are important during the winter months to avoid these common health conditions. There are many food and non-food substances that can be toxic when eaten by dogs. It's important to be diligent all year about what your dog has access to that might harm him if he eats it. In the winter-time, there are a few extra substances around to be aware of. Rock Salt: Salt is commonly used as a de-icer on roads and sidewalks in cold climates. Some dogs are drawn to licking it up. Dogs also ingest salt when they walk through it, then lick their feet, bellies, and legs to clean it off. Eating small amounts of de-icing products can cause vomiting and diarrhea. Make a habit of wiping down your dog's belly, feet, and legs when she comes inside during the winter. Doing this will remove the de-icer before it can irritate the skin or be ingested by your pet. Consider a pair of doggie booties for your dog to wear outside during the winter. These will prevent salt from collecting on his feet. Many dogs tolerate them very well. Booties have the bonus benefits of keeping your dog's feet warmer and preventing ice from developing in the hair between the toes. Antifreeze: There is more antifreeze around during the winter and it is extremely hazardous to dogs. One tablespoon can kill a 10-pound dog. Unfortunately, dogs can actually be drawn to licking up spilled antifreeze; the sweet taste attracts them. Clean up any antifreeze spills immediately and well. There are antifreeze products that are labeled as "pet friendly" or "safer for pets." These products contain an additive that causes the antifreeze to taste bitter rather than sweet. It is important to understand that these products are still not safe for pets to ingest. The hope is that animals will be more unlikely to be drawn to the more bitter taste but you should still be diligent about cleaning any spills. An outdoor dog MUST have shelter during the winter. Your dog's shelter must be well-insulated and should be big enough for him to stand up, turn around, and curl up. The shelter must also have a wind-block to keep frigid air from blowing in on him. You MUST keep fresh water available for your outdoor dog at all times. You must check the water bowl often to ensure that it hasn't frozen, tipped over, filled with snow, or gotten dirty. Fresh, unfrozen water is essential to your dog's health. 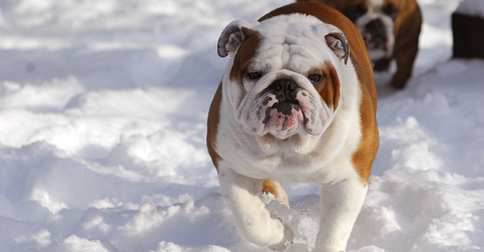 An outdoor dog will require increased calories during the winter. Give your dog more food so that he can keep her body conditioning up and be better able to stay warm. With some attention to your dog's extra needs during cold weather, you can both better enjoy the season and look forward to the warmer days ahead. HardyPet offers a product bundle which includes a daily vitamin supplement (choose from HardyPet Complete/Skin&Coat/Joint/Immune), the PRO6 canine probiotic, and Premium Fish Oil supplement. This bundle has everything a dog needs to have the best chance to stay healthy during the cold winter months. CLICK HERE for the special, choose the daily vitamin supplement that is the best fit for your dog, and enjoy a great discount and free shipping for bundling the products together.